Angry Koala Gear: NIGHT OF THE LIVING DEADPOOL #1 Reanimates a Second Printing! You just can’t keep a good zombie down! Marvel Comics is proud to announce that NIGHT OF THE LIVING DEADPOOL #1 has sold out at the distributor level (though copies may still be available at retail level) and will immediately head back to press! From blockbuster Deadpool writer Cullen Bunn (Deadpool Kills the Marvel Universe, Deadpool Kills Deadpool) and red-hot artist Ramon Rosanas (Spider-Man: 1602) comes and undead Deadpool epic unlike any other! Deadpool has woken up from his epic food coma to a world changed. Not only are there zombies everywhere – but everything is grey! Yikes! Don’t miss out on the Deadpool adventure that has everyone talking as the Merc with a Mouth returns to take on hordes of the undead this February! 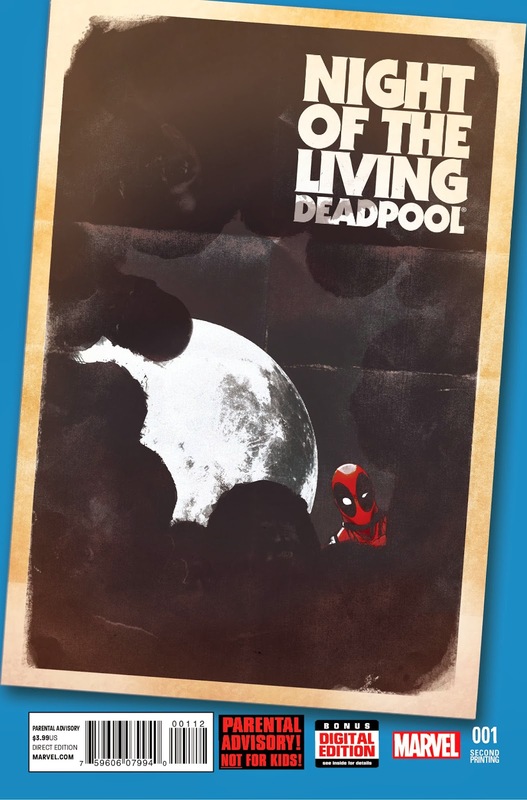 Don’t miss theNIGHT OF THE LIVING DEADPOOL #1 2ND PRINTING VARIANT!